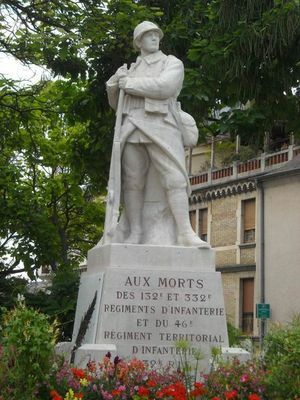 This monument designed by architect Émile Fanjat was erected by public subscription launched in 1921 at the initiative of the former 132nd Infantry Regiment, that was installed before the war in Reims, in order to honor the memory of the soldiers who fell in Les Éparges between 23 October 1914 and 12 April 1915. The statue of the "poilu" (French World War I fighter) overlooking the monument is the work of the sculptor Paul Lefebvre. Inaugurated in 1925 at its original location, Cours Jean-Baptiste Langlet, the monument was transferred on 27 October 1933 to Place Léon Bourgeois, where it stands today. There is no review about Monument To The Dead Of The 132Nd, 332Nd Ri And 46Th Territorial, be the first to leave one !